Functional pulmonary atresia is characterized by a structurally normal pulmonary valve that does not open during right ventricular ejection. Extremely high perinatal pulmonary vascular resistance may induce functional pulmonary atresia in the neonate resulting in an ineffective forward ejection of the right ventricle and severe tricuspid regurgitation. This rare clinical condition is usually associated with Ebstein's anomaly, tricuspid valve dysplasia, Uhl's anomaly and neonatal Marfan syndrome. ,,, However, functional pulmonary atresia is only rarely reported in newborn infants who have anatomically normal hearts. We report a newborn who was diagnosed as functional pulmonary atresia by Doppler echocardiography with normal intra-cardiac anatomy. A male infant weighing 2.8-kg was born at 38 weeks of gestation with Apgar scores of 4/5 at 1 and 5 min respectively. He presented with respiratory distress and cyanosis. He had already been intubated when he was transferred to our department for evaluation of suspected cyanotic congenital heart disease. Cardiovascular examination revealed generalized cyanosis, single S2 and 1/6 systolic murmur best heard over the left sternal border. After three hours of birth, oxygen saturation by pulse oximetry was 24%. Arterial PO 2 and PCO 2 were 18 mmHg and 52 mmHg respectively. Severe metabolic acidosis was documented (pH: 6, 9, HCO 3 : 7 mEq/L, base deficit:-14). Dopamine was started for low blood pressure (41/20 mmHg) and bicarbonate infusion was initiated. The chest radiogram showed markedly reduced pulmonary vascular markings [Figure 1]. The electrocardiogram showed right axis deviation with right atrial enlargement and right ventricular hypertrophy. Echocardiography showed marked hypertrophy of the right ventricle right ventricle and left ventricle diastolic dimensions were 5.6 and 7.9 mm respectively. Tricuspid annulus and mitral annulus were measured as 5.3 and 7.4 mm respectively. The right atrium was moderately dilated with mild to moderate tricuspid regurgitation. Based on peak tricuspid jet velocity (3,6 m/sec), peak right ventricular systolic pressure was 60 mmHg. The atrial septum bulged to the left and small secundum atrial septal defect presenting right to left shunt was seen. Right ventricular outflow tract was anatomically normal, pulmonary valve had normal echo density with restricted mobility. The size of the pulmonary artery was normal [Figure 2]. There was no antegrade flow across the pulmonary valve. Pulmonary regurgitation was not documented by color doppler flow mapping [Figure 3]a. The ductus arteriosus was found to be closed. According to the first echocardiographic examination, we thought that diagnosis might be anatomical pulmonary atresia, and PGE1 was started immediately. Doppler echocardiogram was repeated shortly after mechanic ventilation and the initial echocardiography, it showed trivial forward flow across the pulmonary valve (maximal velocity of 0.3 m/sec). So, functional pulmonary atresia was established in our patient who had no accompanying other cardiac anomalies. Moreover the ductus arteriosus was still closed in this echocardiographic examination. Hence, PGE1 was interrupted and pulmonary vasodilators in the form of inhaled ilioprost (0.5 mcg per kg) and oral sildenafil (0.5 mg per kg every 6 hours) was administered to begin with followed by inhaled nitric oxide (20 ppm). There was a significant improvement in oxygen saturation from 20% to 65% at the end of 6 th hour. Arterial oxygen saturation by pulse oximetry increased to 75% and 85% on days 2 and 3 respectively. Antegrade flow velocity into pulmonary artery increased gradually (from 0.9 m/sec to 1.2 m/sec) over 6 days. During the nitric oxide therapy, blood pressure, FiO 2 , pulse oximetry, arterial blood gases, and methemoglobin level were monitored. Methemoglobin level was not found more than 2.3%. He was followed by the mechanical ventilation in the synchronized intermittent mandatory ventilation (SIMV) mode because we had not any chance to apply high frequency oscillatory ventilation. Finally, by day 6, oxygen saturation was 97% and pulmonary artery flow velocity was normal (1.9 m/sec) [Figure 3]b. The patient was weaned from the ventilator on day 6 and nitric oxide was discontinued gradually. There was not any rebound pulmonary hypertension. Other vasodilators were stopped on day 10. He had not any episodes of pulmonary hypertension crisis during the hospitalization. Subsequently, the patient was hemodynamically stable and he was discharged on day 15. At 2 months of age, the patient had no cyanosis and other signs of congestive heart failure. Echocardiography showed a completely normal heart with regression of the right ventricular hypertrophy. Functional pulmonary atresia is a rare condition, associated with high pulmonary vascular resistance. Diagnosis of this condition is very important and must be distinguished from anatomical pulmonary atresia for optimal management protocol. PGE 1 infusion and surgery or therapeutic catheterization are life-saving in anatomical pulmonary atresia, whereas pulmonary artery pressure lowering drugs are the most useful therapy in functional pulmonary atresia. , Two dimensional and doppler echocardiography play an important role in the differentiation of functional atresia from anatomical atresia. 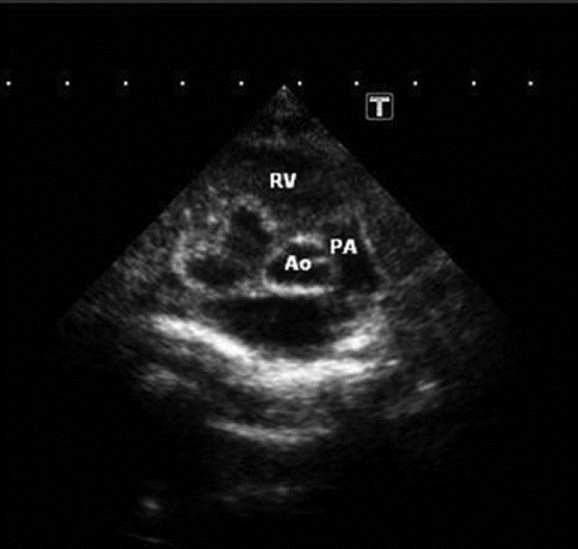 Normal anatomy of the of right ventricular outflow tract, normal echo density of the pulmonary valve, and the lack of antegrade flow across pulmonary valve during systole characterize functional pulmonary atresia. But a few studies reported that doppler echocardiography during hyperventilation or crying may demonstrate opening of pulmonary valve. , This finding could be of help to diagnose this condition. Although presence of pulmonary regurgitation is reported as a diagnostic criteria, Suzuki, et al., reported that the absence of pulmonary regurgitation may not exclude functional pulmonary atresia. Similarly, pulmonary valve regurgitation was not present in our patient. Previous studies report normal or enlarged right ventricle in patients with functional pulmonary atresia. Suzuki, et al., reported significantly larger right ventricular dimensions in patients with functional atresia compared to the anatomical group. There was significant right ventricular hypertrophy in our patient. Functional pulmonary atresia is usually found in association with lesions like Ebstein's anomaly, Uhl's anomaly, neonatal Marfan syndrome, tricuspid valve dysplasia and transient myocardial ischemia with severe tricuspid regurgitation. ,,,, Filho, et al., reported a case of a newborn with functional pulmonary atresia with normal intracardiac anatomy. We could not exclude perinatal hypoxia, so possible perinatal hypoxia might have played a role on the increased pulmonary vascular resistance. Although we do not have any fetal cardiac information in our patient, antenatal restriction or closure of ductus arteriosus may also cause pulmonary hypertension. In our case, it was found out that ductus arteriosus was closed three hours later after the birth. In conclusion, differentiation of functional pulmonary atresia from anatomic causes is critical since the management approaches are vastly different for this entity. A judicious combination of pulmonary vasodilator therapy in combination with ventilation and maintenance of cardiac output can potentially restore normal hemodynamics in the critically ill patients. 1. Andelfinger G, Shirali GS, Raunikar RA, Atz AM. Functional pulmonary atresia in neonatal Marfan's syndrome: Successful treatment with inhaled nitric oxide. Pediatr Cardiol 2001;22:525-6. 2. Freedon RM, Culham G, Moes F, Olley PM, Rowe RD. Differantiation of functional and structural pulmonary atresia: Role of aortagraphy. Am J Cardiol 1978;41:914-20. 3. Suzuki H, Nakasato M, Sato S, Komatsu H, Hayasaka K. Management of functional pulmonary atresia with isoproterenol in a neonate with Ebstein's anomaly. Tohoku J Exp Med 1997;181:459-65. 4. Butera G, Pomè G, Giamberti A, Frigiola A, Chessa M, Carminati M. Surgical treatment of tricuspid valve dysplasia in the neonatal period. Ital Heart J 2003;4:211-3. 5. Tumbarello R, Adatia I, Yetman A, Boutin C, Izukawa T, Freedom RM. From functional pulmonary atresia to right ventricular restriction. Long term follow up of Uhl's anomaly. Int J Cardiol 1998;67:161-4. 6. Derbent M, Anuk D, Tarcan A, Varan B, Gurakan B, Tokel K. Functional pulmonary atresia in a patient with neonatal Marfan syndrome caused by a c.3602G>A mutation in exon 29 of the FBN1 gene. Clin Dysmorphol 2008;17:127-8. 7. Almeida-Filho OC, Schmidt A, Marin-Neto JA, Maciel BC. 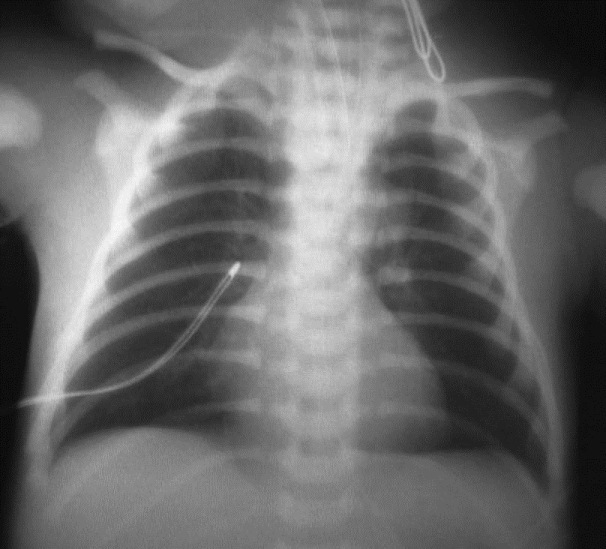 Functional pulmonary atresia in a newborn with normal intracardiac anatomy. Pediatr Cardiol 2002;23:647-9. 8. Silberbach GM, Ferrara B, Berry JM, Einzig S, Bass JL. Diagnosis of functional pulmonary atresia using hyperventilation and doppler ultrasound. Am J Cardiol 1987;59:709-11. 9. Lee CL, Hsieh KS, Huang TC, Lin CC, Choong CS. Recognition of functional pulmonary atresia by color doppler echocardiography. Am J Cardiol 1999;83:987-8, A11. 10. Hiraumi Y, Watanabe K, Tomita H, Kurosaki K, Saito A, Tanizawa T, et al. Doppler echocardiographic differentiation of functional from anatomical pulmonary atresia: Analysis using quantitative parameters. Circ J 2002;66:665-7. 11. Gewillig M, Dumoulin M, van der Hauwaert LG. Transient neonatal tricuspid regurgitation: A doppler echocardiographic study of three cases. Br Heart J 1988;60:446-51.